This great tea set was chosen by Moroccan Caravan and especially made for Moroccan Caravan. The set includes a finely hand shaped and engraved brass tray with intricate motifs by a skillful craftsman in the medieval city of Fes, Morocco 27" in diameter. The set also comes with a very nice and sturdy wooden stand 23" high with beautiful arabesque decoration also called musharabi work, 6 tea glasses in red, green and blue, the set also includes a silver teapot, under teapot and teapot holder. The teapot can be cleaned using a silver cleaner or you can try Wright's Silver Cream and brass with brass cleaners found in any hardware store. 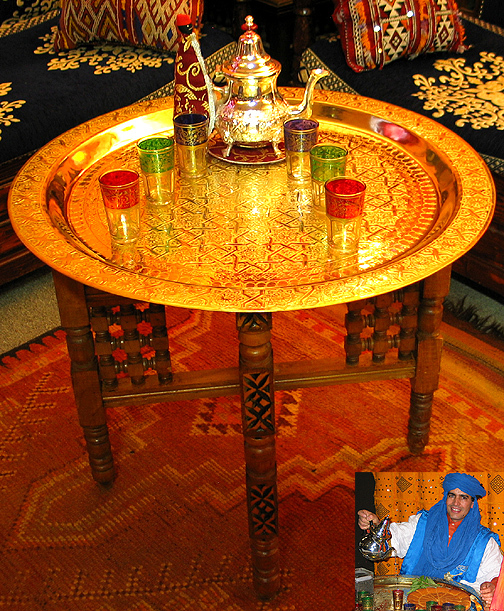 Check out our culture & recipes for a free Moroccan tea recipe. Please Note that shipping cost is subject to adjustment, up or down, depending on zip codes. this is done after we receive your order.